I've been sort of MIA this week. I have no explanations or excuses, other than the fact that I've been really exhausted (due to a lot of super late nights which is of no one's fault but my own...kind of...insomnia will do that to you). I've been trying to force myself to take breaks from knitting, which is kind of hard when you're soooo close to finishing a project, but both hands really need it. Because of my high levels of tiredness blogging had to be put on the back burner too until I could properly form sentences that actually made sense when read together in a paragraph. Lucky for me, the past few nights my entire being finally had had enough and I was rewarded with three nights of good sleep! Buuut that doesn't I'm able to sit here and write all the blog posts I want. I have volunteered to read to my kiddo's class this afternoon and I can't back out now. 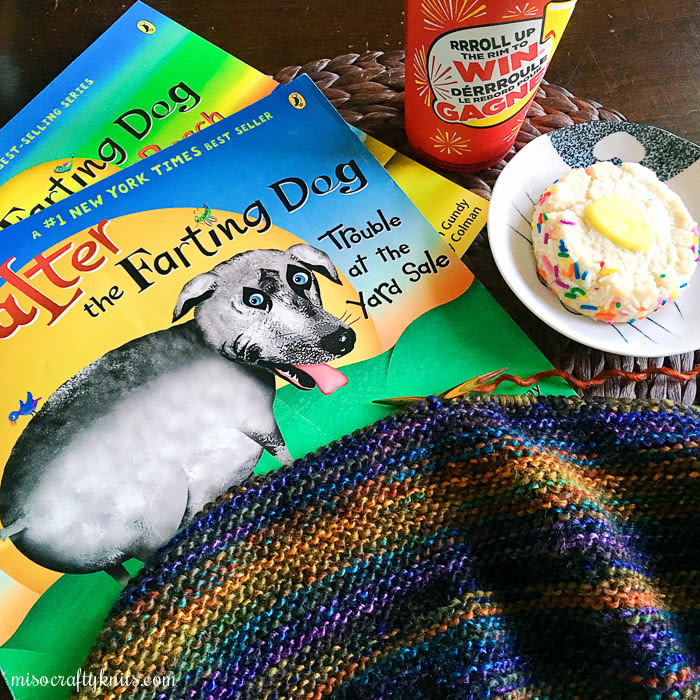 Not when your kid is extremely excited that you're going to read about the crazy adventures of a loyal but highly flatulent dog and its loving human family to his class. I can't disappoint him now! ⤷ I recently went through my queue on Ravlery and managed to slim down the list from 14 pages to a mere 12. I'm sure there were a whole lot more patterns that I could have deleted from the list, as a lot of them were there solely to remind me that they existed and to serve as possible inspiration (re: patterns I'd love to knit but the style isn't me, so maybe possible gift knits). But then this past week SO many awesome patterns were released, causing my queue to swell up to 13 pages. Oops! ⤷ But once I get at least two projects off the needles (and I'm talking bigger projects, like the shawls or garments) I'm totally planning on casting on either a Radiate pullover (by Joji Locatelli), a Fast Forward pullover (by Veera Välimäki), or a Flyway Twist shawl (also by Veera) - these are just three of the twelve patterns in the fourth installment of the Interpretations collection co-designed by Joji and Veera. This fourth volume is truly such a beautiful collection! ⤷ As much as I absolutely want to cast on something from Interpretations, I quite honestly think the next selfish knit will be Camaro by Tanis Lavallee. Those stripes! The endless colour combinations! I want to knit several of these! I'm totally envisioning a slim fit black and white, monochromed version; a hip length version in a single colour gradient set on a background of grey; a cropped pink, black, and grey version (surprised? ); or even in one of Tanis's handpicked palettes (I love them all but have my eye on the Prism palette), just to name a few of my possibilities. ⤷ Another collection that came out this past week is Heart on My Sleeve by Tin Can Knits. This book of sweaters is actually a collaboration between the ladies of Tin Can Knits and some of their favourite knitwear designers, such as Ysolda Teague, Bristol Ivy, Victoria's own Jane Richmond and Shannon Cook, and the previously mentioned Joji Locatelli and Tanis Lavallee. All of the proceeds (after Ravelry and PayPal fees, that is) are going to the Against Malaria Fund. ⤷ Most, if not all, of the future projects that I've been thinking about, and even all of the sweaters in the Heart on My Sleeve collection, just so happen to all be knit in DK weight yarn. Hmmm...my stash is sorely lacking in DK weight. I'm either going to have to knit like the wind so that I can justify purchasing some, or I'm going to have to destash something in my stash order to obtain the room. Problem is, I love everything that's in my stash! How am I suppose to pick what to get rid of? ⤷ I don't know why I'm thinking so much about selfish knitting when I'm thinking about doing some charity knitting. Once again my son's school will be holding their annual fundraising auction at the end of the year, and once again I'm thinking of knitting something to donate to the cause. I got such a great response and thoroughly enjoyed knitting Sylvia McFadden's Waiting For Rain last year, that I'm thinking of knitting another one of her patterns from her book, Shawl Joy, or her newest pattern, Water. I just have to find something suitable in my stash to knit with AND something I wouldn't mind parting with once it has been knit up! ⤷ Oh! I finished a thing. It's nothing major, but it's still a finished object! A few days before Valentine's Day I felt compelled to knit myself a ring. Using some leftover Harrisville Designs Shetland wool (I seriously used only a few yards!!) 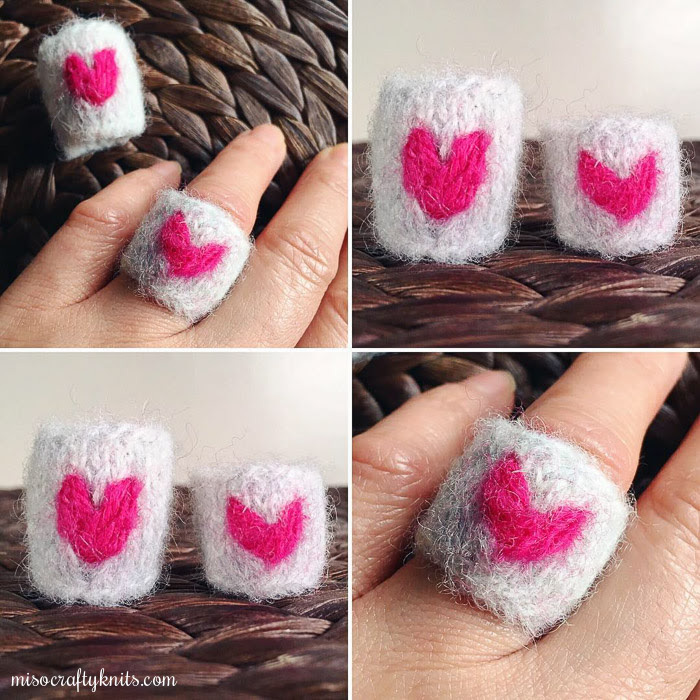 and a length of hot pink Patons Classic Wool that I found in a scraps bag, I made myself a Heartfelt Ring (designed by Tiny Owl Knits). My first attempt, I had knit according to the pattern, turned out too long. But since it literally took me 10 minutes to knit AND felt the ring, I quickly whipped up a second. Only this time I made the ring smaller and shorter. Perfecto!! PS: It would also help if I actually clicked "Publish" on this post...!! The ring is cute. I want to make one. Maybe some yoga stretches before you go to bed to relax? I've been seeing some all over Pinterest. I drink a cup of chamomile tea. It relaxes me. Those books look hella funny! Your son would like Who Flung Dung by Ben Redlich. Me and the girls got good giggles from that book when they were little ones. I think the ring is adorable, lots of what you do is amazing, wish I could do as well. I can't wear wool and neither can my sister. I hope the reading of Walter went well, I gave the books and the stuffed dog to my brother-in-law to read to their grandchildren. Enjoy them all. I agree, so many amazing patterns out there right now, I want to knit them ALL!! And I spy some Berocco Millfiori... are you making a Kveta?! I still wear mine every day. Love your little hear ring! I hope you feel more rested soon. I've been scrolling through my pinterest knitting board too recently and remembering all the cool patterns I've pinned and want to make. I'm having to force myself to finish some old projects first!